Muscle tissue has four main properties: Excitability (ability to respond to stimuli), Contractibility (ability to contract), Extensibility (ability to be stretched without tearing) and Elasticity (ability to return to its normal shape). Based on certain structural and functional characteristics, muscle tissue is classified into three types: cardiac, smooth and skeletal. Cardiac muscle tissue forms the bulk of the wall of the heart. Like skeletal muscle tissue, it is striated (the muscle fibres contain alternating light and dark bands (striations) that are perpendicular to the long axes of the fibres). Unlike skeletal muscle tissue, contraction is usually not under conscious control (involuntary). Smooth muscle tissue is located in the walls of hollow internal structures such as blood vessels, the stomach, intestines, and urinary bladder. Smooth muscle fibres are usually involuntary (not under conscious control), and they are nonstriated (smooth). Smooth muscle tissue, like skeletal and cardiac muscle tissue, can undergo hypertrophy. In addition, certain smooth muscle fibres, such as those in the uterus, retain their capacity for division and can grow by hyperplasia. Skeletal muscle tissue is named for its location - attached to bones. It is striated; the fibres (cells) contain alternating light and dark bands (striations) that are perpendicular to the long axes of the fibres. Skeletal muscle tissue can be made to contract or relax by conscious control (voluntary). All skeletal muscle fibres are not alike in structure or function. For example, skeletal muscle fibres vary in colour depending on their content of myoglobin (myoglobin stores oxygen until needed by the mitochondria). Skeletal muscle fibres contract with different velocities, depending on their ability to split Adenosine Triphosphate (ATP). Faster contracting fibres have greater ability to split ATP. In addition, skeletal muscle fibres vary with respect to the metabolic processes they use to generate ATP. They also differ in terms of the onset of fatigue. Based on various structural and functional characteristics, skeletal muscle fibres are classified into three types: Type I fibres, Type II B fibres and type II A fibres. The following is the definition of Fascia provided by the Fascia Research Congress (2009) "Fascia is the soft tissue component of the connective tissue system. It interpenetrates and surrounds muscles, bones, organs, nerves, blood vessels and other structures. Fascia is an uninterrupted, three-dimensional web of tissue that extends from head to toe, from front to back, from interior to exterior. It is responsible for maintaining structural integrity; for providing support and protection; and acts as a shock absorber. Fascia has an essential role in hemodynamic and biochemical processes and provides the matrix that allows for intercellular communication. 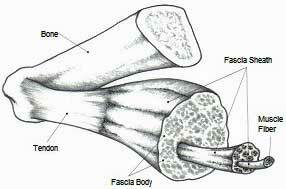 After an injury, it is the fascia that creates an environment for tissue repair. Fascia can refer to dense planar fascial sheets (such as the Fascia lata) as well as joint capsules, organ capsules, muscular septa, ligaments, retinacula, aponeuroses, tendons, myofascia, neurofascia, and other fibrous collagenous tissues". Langevin and Huijing (2009) state that we need to be aware of possible ambiguities and misunderstandings stemming from different meanings of the word "Fascia" because the general meaning of the term can be so vague as to imply little more than some form of connective tissue. "Fascia" encompasses both loose and dense, superficial and deep, and multiple and single layered connective tissues. Myoglobin is a Protein and has oxygen bound to it, thus providing an extra reserve of oxygen so that the muscle can maintain a high level of activity for a longer period of time. Mitochondria are known as the powerhouses of the cell. They act like a digestive system that takes in nutrients, breaks them down, and creates energy for the cell. These fibres also called slow twitch or slow oxidative fibres, contain large amounts of myoglobin, many mitochondria and many blood capillaries. Type I fibres are red, split ATP at a slow rate, have a slow contraction velocity, very resistant to fatigue and have a high capacity to generate ATP by oxidative metabolic processes. Such fibres are found in large numbers in the postural muscles of the neck. These fibres also called fast twitch or fast oxidative fibres, contain very large amounts of myoglobin, very many mitochondria and very many blood capillaries. Type II A fibres are red, have a very high capacity for generating ATP by oxidative metabolic processes, split ATP at a very rapid rate, have a fast contraction velocity and are resistant to fatigue. Such fibres are infrequently found in humans. These fibres also called fast twitch or fast glycolytic fibres, contain a low content of myoglobin, relatively few mitochondria, relatively few blood capillaries and large amounts glycogen. Type II B fibres are white, geared to generate ATP by anaerobic metabolic processes, not able to supply skeletal muscle fibres continuously with sufficient ATP, fatigue easily, split ATP at a fast rate and have a fast contraction velocity. Such fibres are found in large numbers in the muscles of the arms. Most skeletal muscles of the body are a mixture of all three types of skeletal muscle fibres, but their proportion varies depending on the usual action of the muscle. For example, postural muscles of the neck, back, and leg have a higher proportion of type I fibres. Muscles of the shoulders and arms are not constantly active but are used intermittently, usually for short periods, to produce large amounts of tension such as in lifting and throwing. These muscles have a higher proportion of type I and type II B fibres. Even though most skeletal muscle is a mixture of all three types of skeletal, all the skeletal muscle fibres of any one motor unit are all the same. In addition, the different skeletal muscle fibres in a muscle may be used in various ways, depending on need. For example, if only a weak contraction is needed to perform a task, only type I fibres are activated by their motor units. If a stronger contraction is needed, the motor units of type II A fibres are activated. If a maximal contraction is required, motor units of type II B fibres are activated as well. Activation of various motor units is determined in the brain and spinal cord. Although the number of the different skeletal muscle fibres does not change, the characteristics of those present can be altered. The fast muscle (what the researchers call type IIa) moves 5 times faster than the slow muscle, and the super-fast (called type IIb) moves 10 times faster than the slow muscle fibre. The average person has approximately 60% fast muscle fibre and 40% slow-twitch fibre (type I). There can be swings in fibre composition, but essentially, we all have three types of muscle fibre that need to be trained. Various types of exercises can bring about changes in the fibres in a skeletal muscle. Endurance type exercises, such as running or swimming, cause a gradual transformation of type II B fibres into type II A fibres. The transformed muscle fibres show a slight increase in diameter, mitochondria, blood capillaries, and strength. Endurance exercises result in cardiovascular and respiratory changes that cause skeletal muscles to receive better supplies of oxygen and carbohydrates but do not contribute to muscle mass. On the other hand, exercises that require great strength for short periods, such as weight lifting, produce an increase in the size and strength of type II B fibres. The increase in size is due to increased synthesis of thin and thick myofilaments. The overall result is that the person develops large muscles. You can develop your fast-twitch muscle fibre by conducting plyometric or complex training (combination of plyometrics and weights) to build the fast muscle (IIa) and performing sprinting types of training to build the super-fast (IIb) to the point where you can release exercise-induced growth hormone. The body itself produces the best form of growth hormone. If you want to accelerate muscle building then, use large muscle group targeted weight training in combination with anaerobic sprinting-types of exercise to increase your body's natural muscle building steroids.